Can a Felon Become a Travel Agent? Job options may be limited for felons recently out of prison, but there are resources available. Felons with experience or interest in the travel industry might want to consider becoming a travel agent. 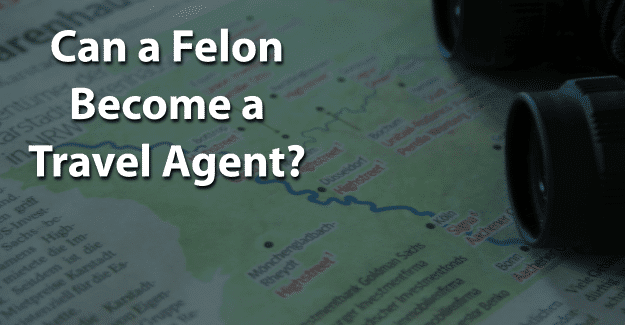 This blog post will cover the issue of whether or not a felon can become a travel agent. How Much Does a Travel Agent Earn? A travel agent may visit various destinations to gain firsthand experience to make specific recommendations to clients. He or she may visit hotels, resorts, and restaurants to evaluate the quality of the business. A high school diploma is usually required for someone to become a travel agent. Courses may be found at a community college, vocational school, or industry association to become a travel agent. Employers typically give preference to those who have had higher education in addition to on-the-job training. The minimum professional certification for a travel agent is a Certified Travel Associate (CTA). This is typically earned after 18 months of travel-industry experience. Someone cannot become certified until they’ve been on the job for least 18 months. Then, they just have to pass an exam. There are no licensing requirements to become a travel agent. A travel agent specializing in cruises can attain certification as an Accredited Cruise Counselor (ACC) through the Cruise Line International Association (CLIA). He or she must complete a training program and have taken at least two cruises, inspected at least five ships, and sold at least 25 staterooms. Someone does not need certification as a travel agent to become a home-based travel agent. Seeking travel agent certification is not necessary, but it demonstrates a dedication and level of knowledge to others in the profession. The Travel Agent Proficiency Test (TAPT) is a way to demonstrate competence when becoming a travel agent. It can be found through the Travel Institute. In addition, different levels of certification are offered depending on a travel agent’s experience. Someone with the least five years of experience can become a Certified Travel Counselor (CTC). Reaching higher levels can mean pay increases or better job opportunities within the field. A license is issued by a state agency to practice a profession and is required in order to call oneself a licensed professional. Some states have a single license and some have a level system. Licenses, as well as requirements, vary from state to state. Licensing can be viewed as mandatory certification. Under a licensure system, states define the practice of a profession and stipulate that these tasks may be legally performed only by those who are licensed. A certification is typically a voluntary process, although certification can be mandatory or required to practice in certain states. Certification is often provided by a private organization for the purpose of providing the public protection. It shows that the individuals who have successfully met all requirements for the credential can perform their profession competently. To become a travel agent, neither of these are required, though certification can help someone find a well-paying job. According to the U.S. Bureau of Labor Statistics, there were approximately 81,700 travel agents working in 2016. The median annual salary for travel agent was $36,990 in 2017. The median salary is that at which half of travel agents earned more and half earned less. Employment of travel agents is expected to decline approximately 12 percent between 2016 and 2026. This decrease is most likely due to individuals’ access to the internet to research vacations and book their own trips and arrangements. Since there are no specific licensing requirements to become a travel agent, there are no state regulations regarding a criminal background. However, some factors are important for any felon wanting to enter the travel industry. First, a felon who completes training for a Certified Travel Agent is required to undergo a criminal background check before starting employment. For those felons who are seeking to become an independent, home-based agent, they can align themselves with a host travel agency. Then, they’ll facilitate making travel arrangements for the host agency’s clients. To establish a host relationship, a background check and a credit check are usually required. Some states require travel agents to have a business license to sell travel services. Individual state licensing agencies can be consulted for further information. If a business license and a Tax Identification Number are required, a felon can obtain them. Some agencies prefer travel agents with personal experience in visiting a particular country. For felons, this may be challenging due to potential restrictions in obtaining a travel visa, although a felon is able to obtain a travel visa. To have the best chance at securing a job as a travel agent, a felon should be honest about their background. He or she should also demonstrate how they’ve overcome their past. There are re-entry programs, such as drug treatment, and educational opportunities for felons who need them. For many felons, having their felony expunged can give them the chance they need to begin with a clean record and succeed in becoming a travel agent. It’s a challenge, but it might be worth it for a felon that wants to become a travel agent. Having his or her record expunged and also documenting any training programs or additional education could make the essential difference in a felon succeeding in becoming a travel agent. Having support from family, friends, or previous employers can also make a huge difference. A felon doesn’t have to be defined by his or her crime. We’re not defined by our mistakes but by how we recover from them. He or she can begin again and live an honest life no matter how difficult it might seem. What do you think about this blog post? Have you or someone you know been in the situation of trying to become a travel agent with a felony? What was that like for him or her, and how did he or she achieve success? Please tell us in the comments below.